Location: St. Buryan, Cornwall, England. 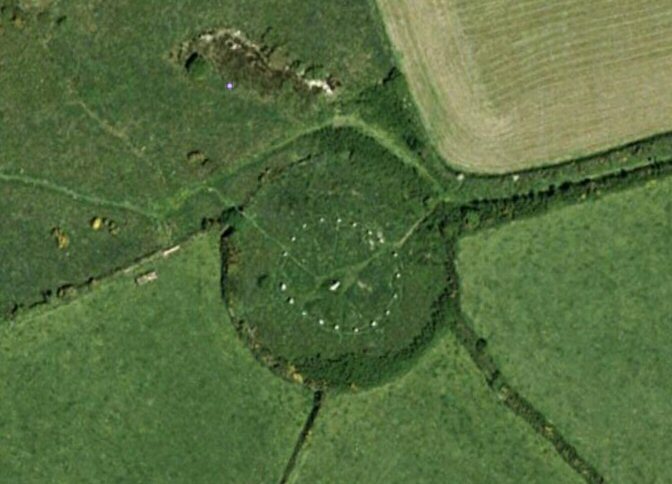 Grid Reference: 50.09 N. 05.62 E.
Boscawen Un: ('Type B', Flattened Stone Circle). Composed of 19 evenly spaced granite uprights with a large (2.5m) single quartz obelisk in the middle. this is one of Cornwall's finest stone circles. It is aligned through the central menhir to nearby Men-An-Tol. William Stukeley believed this to be the first ring erected by incoming druids. It is situated near to Lands End at the southern most point of England. This stone circle is actually an ellipse (24.9 x 21.9m) with the longer axis orientated NW - SE. The stones are graded in height towards the west. Analysis of the circle’s architecture suggests that the central stone is likely to have been erected before the rest of the circle; it is shaped like an axe and contains relief carvings of two stone axes at the bottom of the stone. 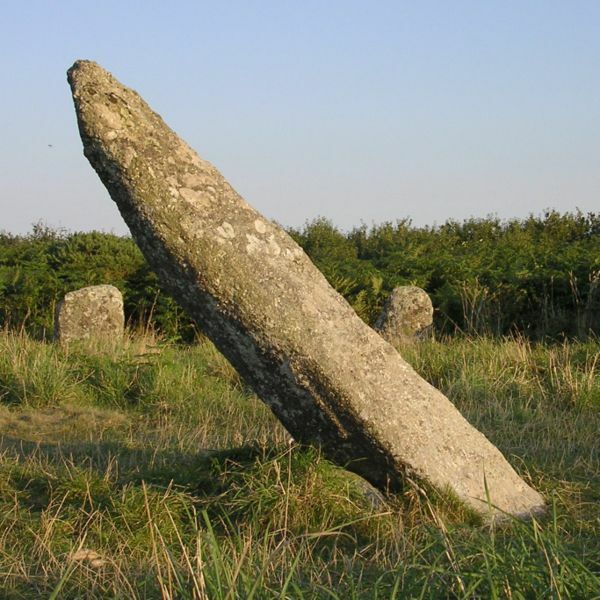 Several sources of greenstone, from which many Cornish polished stone axes were made, are found in west Cornwall and it has been suggested that the Boscawen Un circle was built to celebrate the axe. The circle has been restored and now sits on private land. Focused around Boscawen Un stone circle were the sites of four barrows, only one of which is still upstanding and this is now in poor condition. The stones have their smoother sides facing inwards. To the South West of the rings centre is a tall pillar which now leans considerably. Thom classified this ring as a Type B flattened circle which suggests that it was marked out with a geometric basis. The construction of such "circles" is based on that cornerstone of sacred geometry, the Vescica Pisces. A large gap in the west may be the site of an entrance. Lockyear believed that the quartz stone placed W-SW of the ring was placed in honour of the May day Sun, which would have risen over the centre of the circle. The leaning stone aligns exactly with the centre stone of Men-An-Tol, it was determined by archaeology to have been positioned like this originally suggesting a deliberate alignment of the two sites. It is angled at approximately 53° and points towards the midsummer sunrise in the NE. 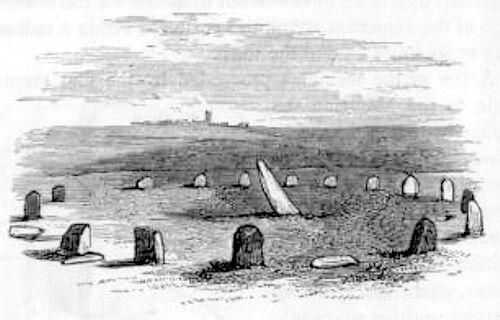 The number nineteen may also be significant as both the nearby Merry Maidens and Tregeseal East stone circles also comprise nineteen stones. William Borlase noticed this and suggested that it related to the twelve months of the year and the number of days in the week. The 18.61 year cycle between major lunar standstills is widely known. It is interesting to note that the longer axis is aligned with the northern minor lunar standstill, which may also be significant here. John Michell has identified seven alignments passing through Boscawen-Un, including one which runs from the circle in the direction of the Samhain sunrise. This alignment, also noted by Sir Norman Lockyer, includes a menhir at Trelew (SW 4217 2693) from which W. C. Borlase excavated fragments of human bones, and a cup-marked stone at Castallack (SW 4540 2545). Lockyer identified a number of astronomical alignments, but later work by Alexander Thom and John Barnatt fails to support their significance. Burl is sceptical of both Michell's and Lockyer's alignments. A version of the Welsh triads mentions "Beiscawen" as being one of the three principal 'Gorsedds' of Britain. Gorsedd's are the traditional name for the meeting places of druids. Like its nearest neighbour, this circle has also attracted the legend that the stones are the petrified remains of girls who were turned to stone by the Devil for dancing on the sabbath.